"Janine Friedman is famous. She’s the miraculous ‘soul survivor’ of a suicide bombing in a Jerusalem synagogue ten years ago. The bombing killed both her parents and changed not only her life, but also that of Dave Armstrong, the tourist who dug her out of the rubble and ‘found God’ as a result. Most people can remember where they were when it happened – the image of that little girl with her bleeding, ruined hands being dragged into the light. I'm not all too sure what to think. Parts of the story was interesting, some parts seemed too unrealistic and other parts were a little unexciting. In all, this book was just downright depressing. Nothing turns out right, and yet somehow Janine still found faith. 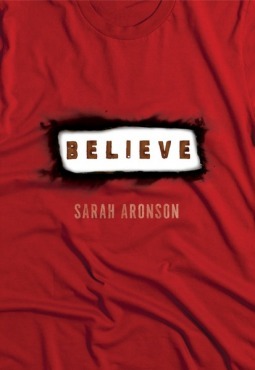 I suppose it could be the process of everything (even if every choice she made did blow up in her face) that made her "believe" but it really didn't seem like the book as an intrinsic whole would make it's reader "believe." Nothing out of the normal happens & Janine who felt all she had were ugly hands is still Janine who feels all she has is ugly hands, just with a changed attitude of wanting to cooperate with the press & use her fame to do good. I really wouldn't trust her opinion or decisions on what's "good" since EVERYTHING turns out for the worst in this book. She even lost ALL of her friends and her boyfriend. It was all very anti-climactic. Janine really came off as whiny and self centered and in the end she was just less whiny and still self centered with little reversions of 'oh yes I must remember to not be self centered at right this moment.' Although through all her character flaws, I still believe her friends acted wrongly. I mean their reasonings, although just at the time, is not worth whatever friendship they had. These people are graduating high schoolers, not kindergartener's. After reading Believe, I didn’t feel empowered, or look at anything in a different way, the book was too depressing for that. I wish the author would have at least given one thing a happy ending. In all it was too anti-climactic, lagged a great deal in the middle and I do not believe the story was executed well enough to have the desired message come across. The book has potential for a meaningful piece, but it just didn’t do anything for me.